If you are running an eCommerce project, you are surely facing the problem of cart abandonment from time to time. If you are a daring merchant who is only going to start their online business and doesn’t know what is cart abandonment, we will tell you. Did you know that there are several types of cart abandonment companies can track? This type of abandonment mostly refers to the one within the travel industry. The customers there start to book a flight or a hotel but leave without completing a purchase. Unlike retail abandonment, the specific features of booking abandonment are that customers may have selected dates they are interested in and the specific travel product. The form abandonment most commonly refers to abandoning forms for quotes, subscriptions, financial products. This is distressing as any online purchase requires some level of form completion. If your forms are long, this is an issue. Filling in the details to receive a service quote, for instance, can take time. This increases the chances that some customers will leave the site before finishing the form. Browse abandonment refers to the process when shoppers who browse a site view category pages and products on site but leave without placing items in their basket or making a purchase. 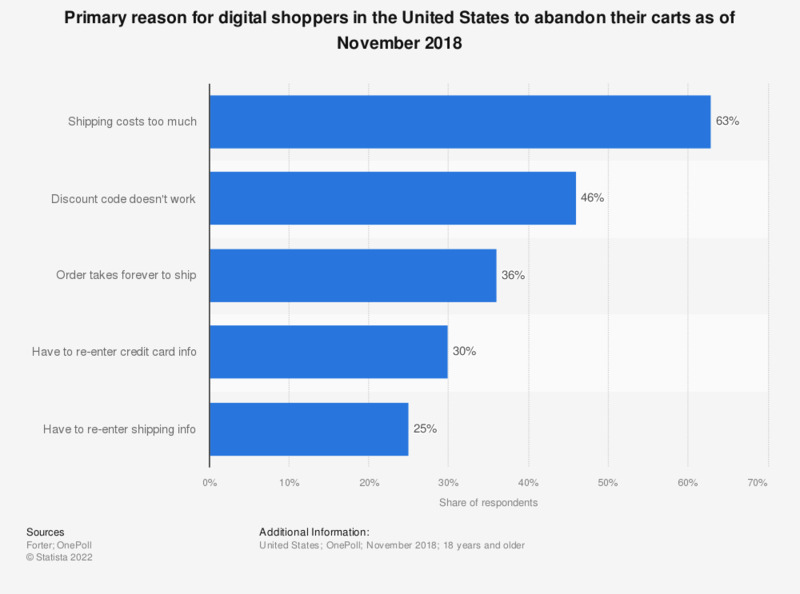 Here is the statistical data presenting information on the primary reasons why digital shoppers abandon their carts in the United States. Cart abandonment due to the expensive shipping made 63% in 2017. People buy products on the Internet because it’s not only convenient but savvy. If they are going to buy something expensive additional shipping fee may negatively affect the purchase decision because it seems frustrating. If they are going to buy some little things that are cheaper on the e-store, huge shipping cost will most likely scare them away as buying those little things online won’t make sense anymore. 57% of your potential customers leave your website after browsing it only. They neither put products into the cart nor buy them. Actually, they were not going to. Browsing is the second most frequent cause of cart abandonment and it will always be a part of retail. Unfortunately, browsing isn’t something that businesses can control. 48% of the users leave your site because they are not ready to make a spontaneous purchase, they want to research the market first in order to make sure that they get the best product/service for the best price. Of course, you want them to come back to you. And it’s possible if you know your competition well and are able to highlight all the benefits a person will get purchasing your product. In a word, you must understand your prospectives and be able to solve their problems with your products/services. 44% of users don’t buy from you because you don’t provide free shipping. Why should they pay shipping fees if your competitor offers free delivery for the same product? You definitely might think how to avoid this issue, otherwise, you will lose customers. 35% of the users leave websites without making a purchase because they can’t find the information about shipping costs. It’s essential to make all the details about the product acquisition as clear as possible. Don’t try to hide the info your prospective customers might not like, if you can do nothing about it, just tell it another way, may the manner of narration be positive. Nobody wants to know unpleasant details when they are on the last step of the checkout process. Be transparent, it boosts people’s trust. 22% of the prospective customers leave websites when they find out that the delivery terms are too long. Nobody wants to wait for the desired product for ages, so try to make your delivery terms faster than your competitors’ and enjoy the increased conversions. 19% of users leave websites because they don’t have enough time or patience to fill in your long detailed forms. Sharing personal information doesn’t make people happy. So, keep your forms as short and simple as possible and provide a one-click purchase, these should help. 18% of the users leave websites due to bad site navigation. It’s difficult to blame them for this reason of abandonment. Having a simple, intuitive, and thought out navigation on your site is a must. We are sure this is not a novelty for you. The takeaway is that you need to recover abandoned cart, but don’t forget to make sure that your website performs correctly, that the checkout process is intuitive, understandable, etc. before you will start the abandoned cart recovery. Why should you recover the abandoned cart? The point is that the user who has already visited the site and even added some products to the cart is more loyal and interested. Statistic says that 75% users who abandoned the cart on e-store still intend to buy the selected items for some time. The users who come back after the follow-up message usually spend 55% more compared to those who order at once. This section will tell you what is remarketing in AdWords and how does Google remarketing work. “Google AdWords remarketing is a form of online advertising that enables sites to show targeted ads to users who have already visited their site. Past visitors will see these ads while they are browsing the web, watching YouTube videos or reading news sites. Do you advertise on Google? Then, you don’t need to do a lot. Just add a piece of Google remarketing code (tag or pixel) to your website and your visitors will be added to your remarketing audiences through browser cookies. Customize this code for different pages if you need it to correspond to more specific categories. With using remarketing you can display Google ads to your previous site visitors while they browse Google partner sites on the Google Display Network. Google recommends targeting everyone who viewed your homepage when you start your first remarketing campaign. But keep in mind that will increase your Google remarketing costs because your ads are retargeted to more individuals. Therefore, you won’t be able to create ads that are quite as targeted. However, you can increase ad relevancy and reduce your cost per click by targeting narrower. Furthermore, you can create different Google remarketing lists for super-targeted remarketing campaigns. For instance, you can choose to show different ads from non-buyers to the customers who have already purchased from you. They may look like discount offers on their second purchase. Sign in to AdWords account. To open the Shared Library, click the tool menu . To create remarketing list, click the plus button and select “Website visitors” . Create the audience “Visitors of a page who did not visit another page” and change the default settings for your own. Visited page – cart confirmation page url. Unvisited page – checkout complete page url. Depending on the time of product storage in the cart choose ‘Membership duration’ parameter. Now you can create a remarketing campaign for these visitors. Use the cart page URL as the final one. “We carefully store your goods, come back and finish the checkout process”. Here is a couple of cart page URL: www.site.com/cart www.site.com/checkout. Remarketing is one of the most powerful AdWords tools. There are plenty of options to use it to your benefit. All of them proved to be really cool. Have any questions on abandoned cart best practices, maybe additions/suggestions? You know they are welcome in the comments ;).